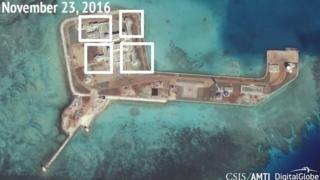 China's island-building has caused dismay in the region. Beijing claims almost all of the South China Sea, but Vietnam, the Philippines, Taiwan, Malaysia and Brunei all have competing claims. In July an international tribunal ruled against Chinese claims, backing a case brought by the Philippines, but Beijing said it would not respect the verdict. The Obama administration has spoken out strongly against the island-building and has sought to build ties with, and among, the South East Asian nations whose claims overlap those of China. It has also pledged to ensure freedom of navigation in the South China Sea and has sent navy ships to sail in contested areas. But it has not threatened to block access to the islands, a step likely to enrage Beijing. Mr Tillerson did not explain how the US might block access to the islands. But he said China's actions in the South China Sea, and its declaration of a special air zone over East China Sea islands controlled by Japan that Beijing also claims, were "illegal". "They are taking territory or control or declaring control of territories that are not rightfully China's," he said. China says it is doing nothing wrong by building in what it calls its territory. It has said in the past that it has no intention of militarising the islands, but has acknowledged building what it calls necessary military facilities for defensive purposes. Responding to Mr Tillerson's comments, Chinese foreign ministry spokesman Lu Kang said China had the right to conduct "normal activities" in its own territory. Asked about the remark on blocking access and China's response, he said he would not respond to hypothetical questions. There have been sporadic incidents between US and Chinese ships in the South China Sea. Late last year, a Chinese ship seized a US navy underwater drone off the Philippines, but later agreed to return it. Chinese ships have also been involved in clashes and stand-offs with ships from Vietnam and the Philippines.